We tend to think of science fiction and fantasy as being like mystery novels — the story is over when you solve the case. So we obsess over questions that have no answers. But here are 10 questions that are better unanswered, either because the possibilities are fascinating or because the answers would be terrible. 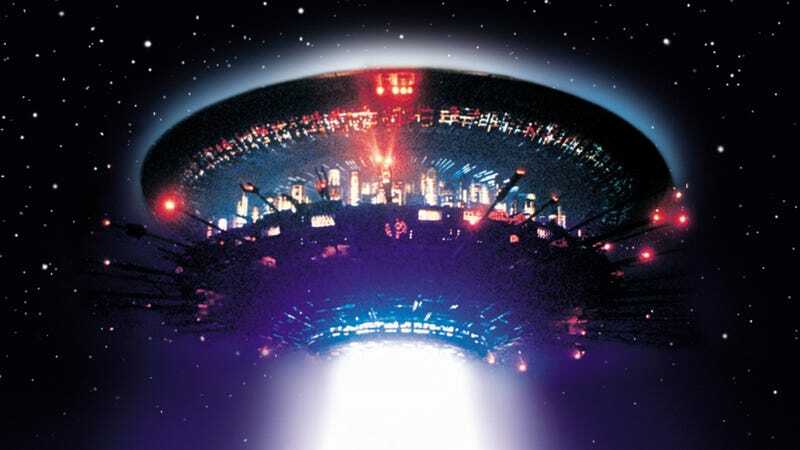 1) What was inside the big spaceship in Close Encounters? We'll never know. Steven Spielberg resisted showing what happens to Roy after he goes inside the Mothership — he did film a scene showing the inside of the ship for the 1980 re-release, under studio pressure. And then he kept that scene out of all subsequent versions of the film, because he did not want that question to be answered — it blew the mystery of his movie completely. For a really thoughtful, considered explanation of why we should never see inside the spaceship, read here. 2) What was Guinan's past with Captain Picard and Q? We get hints in Star Trek: The Next Generation that Guinan has a special bond with Captain Picard, that goes back to before Picard brought her onto the Enterprise. Even apart from their meeting in "Time's Arrow," they have some kind of past together. Similarly, Guinan has a complex backstory with Q, who warns that she's not what she appears — but even though Generations invents a really lukewarm explanation for Guinan's time-sensitivity, we never get most of her backstory. And she's probably better left as a fascinating mystery. 3) Why did the Jaegers have swords in Pacific Rim? 4) Who was that woman in Doctor Who, "The End of Time"? You know, the woman who keeps coming up to Wilf and asking him if he's a good soldier and stuff. She's some kind of Gallifreyan, but there are hints that she's way more important than that. Russell T. Davies hinted in interviews that she's the Doctor's mother, but this was definitely never stated on screen — and we're kind of glad that we never got the full story on her. Maybe she was just some random Time Lady, maybe she was the Watcher. Maybe she was a future reincarnation of the Master, trying to fix her own past mistakes. Hopefully we'll never know. 5) Was Cobb still dreaming at the end of Inception? This is sort of the textbook example of a "question that shouldn't be answered." Was Cobb's top still spinning forever at the end of Inception, or did it eventually fall down — proving that he was back in reality and not stuck in another dream. But the real resolution is that Cobb walks away and doesn't seem to care if the top keeps spinning. 6) Who was that guy who was going to kill Olivia in the LSD episode of Fringe? Fringe was a show with lots of mysteries — and we never got complete answers to a lot of them. Like, what was the Pattern exactly? But part of the fun of this show was just reveling in the weirdness and randomness, and not worrying too much about getting an exact explanation for everything. (And we're very grateful for some loose ends — like thank goodness we never found out the whole story about that religious FBI agent from the start of season two.) So who was that guy on the zeppelin, with the X on his T-shirt, who was going to kill Olivia? Fan speculation has it that he was an aspect of William Bell — but that's not actually stated on screen. Maybe he was just a manifestation of Death in Olivia's subconscious. Maybe it was an alternate reality thing. The episode was an LSD trip! 7) What caused the zombie apocalypse in Romero's zombie films? There's one scientist in Night of the Living Dead who suggests that radiation from a returning Venus probe caused the zombie uprising. But George Romero himself disavowed that explanation later. In fact, we never find out what caused zombies to rise up in Romero's films — and that makes them more terrifying and uncontrolled, like a force of nature. 8) How did Phil get stuck in a stable time loop in Groundhog Day? When Harold Ramis passed away earlier this year, one of the fascinating facts that I learned was that Ramis fought the studio over explaining Phil's predicament in Groundhog Day. The studio desperately wanted to include a scene where Phil learns that he was cursed by a "Gypsy" (SIC) because of something terrible he did in the past, which he needs to atone for. Ramis refused to shoot this scene, and the studio almost went behind his back and added it — but he managed to stop it. And thank goodness. Groundhog Day would be cheapened by any explanation of Phil's curse. 9) How did —SPOILER — at the end of A Wheel of Time? Given that A Memory of Light just came out recently, and the statute of limitations for book spoilers is a lot longer than movie or TV spoilers, we won't explain this one. Just know that there's a mysterious thing involving a pipe that happens at the end of the final Wheel of Time book, and even co-author Brandon Sanderson doesn't know, or can't say, how it happened. 10) Is Deckard a Replicant? Ridley Scott has told everyone what he thinks the answer to this question is — but Blade Runner leaves it ambiguous. (Especially if you watch one of the earlier cuts, without so much unicorn imagery.) Which is as it should be. Thanks to S.A. Hunt, Bryant Francis, Joseph Hughes, Susan Jane Bigelow, Amanda C. Davis, Ferrett Steinmetz, William Cardini, Jennifer Finney Boylan, Jack Lint, Victor D. Infante, Ron Hogan, Gillian Daniels, Shannon Hubbell, Benjamin Blattberg, Chris Matthews, J.E. Mac, Platypus Man, Cheryl Morgan, Jason Bergman, Scott Edelman, Sailor Plutoid, Drew Chial, John Bryden Smith, L Sailor, Harry Connolly, Angela Wells, Yoz Grahame, Daniel Fine, Jacqui Dey, Lee, Andrew Liptak, Erik Sofge, Adam Slight, Emma Osborne, Kate Cowan, Eric Del Carlo, Renee Buchanan and everyone else who helped!